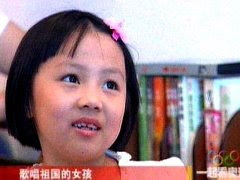 I found out from the Today Show this morning that this little girl, Lin Miaoke, was only lip-synching "Ode to the Motherland", a touching moment during the Olympic opening ceremony. Image-conscious Chinese officials didn't think the real singer was pretty enough. Yang Peiyi, the real singer. She's cute as a button. Shame on them for doing the switcheroo! As if little girls don't have it bad enough in China.